Thank you for your comments. We have submitted them to the USDA prior to the July 3 deadline. If you have a view about how food labeling should be carried out in the United States, now is the time to speak up. Through July 3, the US Department of Agriculture (USDA) is seeking final comments on its proposed system for disclosing the presence of food and ingredients that came from genetically modified crops. (Read the technical details on the USDA website.) Here at the Cornell Alliance for Science we believe that a transparent effective labeling regime needs strong public input from the pro-science community. Please submit your comments here and we'll pass them on to the USDA before the July 3 deadline. 1. Safety. A worldwide scientific consensus agrees that foods and ingredients that come from GM crops are as safe as those from conventionally bred crops. Any labeling standard should not mislead consumers into thinking otherwise. 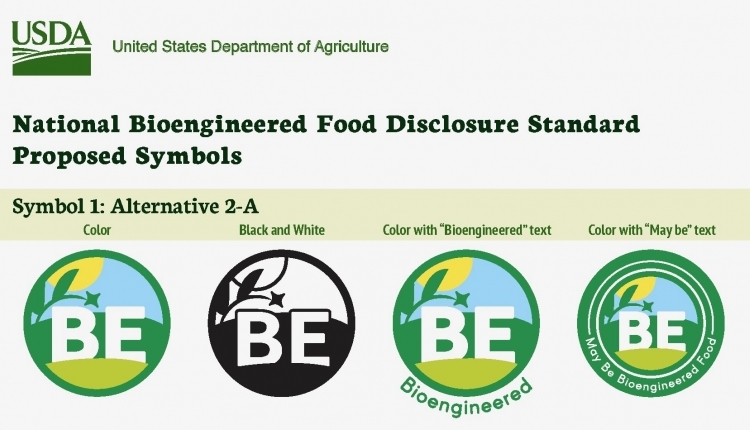 The USDA proposes to use the term “bioengineered" (BE), rather than negative terms like GMO, and nonthreatening symbols that do not evoke fear. Comments are being sought on the proposed symbols, the term "bioengineered," and the disclosure language. 2. Transparency. The USDA needs to set a threshold level beneath which disclosure is not required. It has proposed three options: a) inadvertent or technically unavoidable, and no more than 5% of the specific ingredient by weight; b) inadvertent or technically unavoidable, and no more than 0.9% of the specific ingredient by weight; and c) total amount of BE ingredients no more than 5% of the total weight of the product. Which do you support? 3. Convenience. The law allows companies to disclose BE ingredients on a label via one of three options: words, a symbol, and scannable QR codes. The USDA wants comments on a proposed fourth option — a text message delivered to a consumer's phone — as well as where and at what size disclosure should appear on a label. 4. Definition. In keeping with the language of the law, products created through pioneering editing tools like CRISPR would not be disclosed if the end result mimics conventional breeding or could potentially be “found in nature.” The USDA seeks comments on the definition of “conventional breeding” and "found in nature." 5. Disclosure. The USDA is deciding if highly refined products like sucrose, dextrose, cornstarch, high-fructose corn syrup and vegetable oils, which are produced from GM crops but biologically and chemically identical to those made from non-GM crops, should be disclosed. This decision will have disclosure implications for a wide range of foods. We're keen to hear your thoughts. Please submit your comments below, or in the section on the right, and we'll pass them on to the USDA. The deadline is July 3, 2018. The Comment now on GMO food labeling petition to United States Department of Agriculture (USDA) was written by Cornell Alliance for Science and is in the category Consumer Affairs at GoPetition.